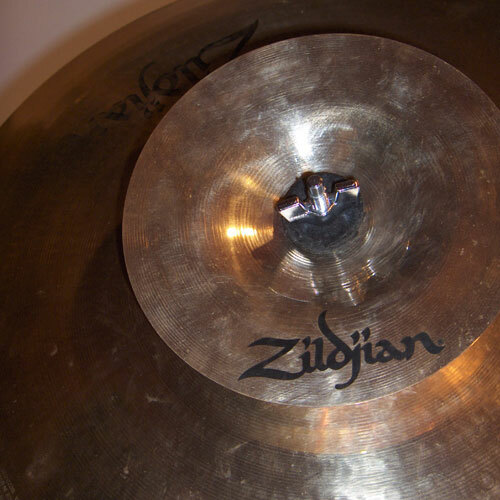 The splash cymbal (or "small Turkish cymbal") is a kind of crash so thin and small (6 to 12 inches in diameter) that it enters automatically into saturation, even if you hit it softly. So it saturates very quickly and resonates very shortly. Its fundamental tone is not necessarily higher than crash because it can be much thinner (and therefore have equivalent amplitude of deformation). The splash is used since the 1930s, in the "Swing" era (suspended use, hit by snare drum stick) but not in symphony or military orchestra (too fragile for clashing one against another, the traditional use). 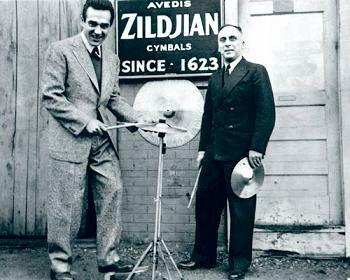 Its invention comes from Gene Krupa (left on photo) who asks Avedis Zildjian (right on the photo) to make him a thinner model of cymbal, for the playing with stick in jazz club, bars, restaurants and dance hall ("cabaret" in French). 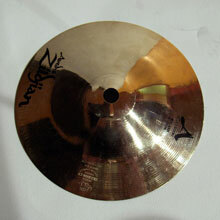 Avedis came from a family of Armenian craftsmen (Zildjian means "armenian cymbal maker" in Turkish), who revolutionized cymbals manufacturing in 1623 (for the Sultan of Turkey in person), making them stronger and with lower fundamental tone (and therefore more audible in the distance). He emigrates from Turkey to United States of America in 1929 and naturally sought to meet the needs of American musicians, essentially of jazz at that time. 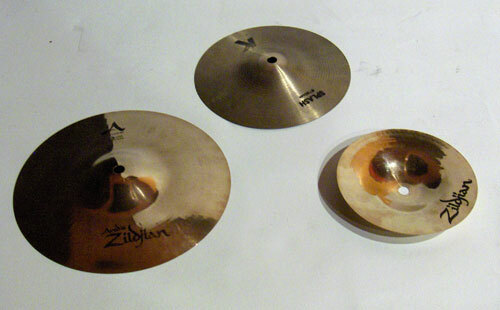 This makes the splash cymbal, the first instrument created on American soil for the modern drumset (if we exclude accessories such as the bass drum pedal or dual tension system of the snare drum), but with a distinction quite subtle compared to the original Turkish cymbals because it could be the same size being just thiner and ancient Greek cymbals, even earlier, were also small but very thick. The craze for "splash" has not waned since and some drummers even prefer it to crash, because they have completely replaced it by splashes (Trilok Gurtu , for example, which uses three splashes and no crash cymbal). It is particularly interesting to mimic a crash, but with a lower volume, which can harmonize with smaller and less powerful drums (this is the case of Trilok Gurtu) or small clubs (beginnings of jazz). Splash is a fragile cymbal which is unnecessary to strike hard, anyway (you can hit it with the tip of drumstick and even the hand as some modern congueros do). It allows also more brutal and surprising accents without hiding the other instruments. It constrats with crash and chinese cymbals on the timbre aspect and its smallness allows to put easily several of them in a set (like Manu Katché who adds often no less than 4 of them plus 2 crashs). 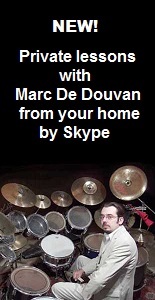 You can (as Dave Weckl ) save space by placing a small splash upside down, on a larger cymbal, taking care to add a felt washer between the two (then you hit the splash on the edge with the shaft). There are also extensions that is attached at the end of a cymbal stand (this is used by Trilok Gurtu) or in parallel with an adjustable boom, which reduces the number of legs on the ground.